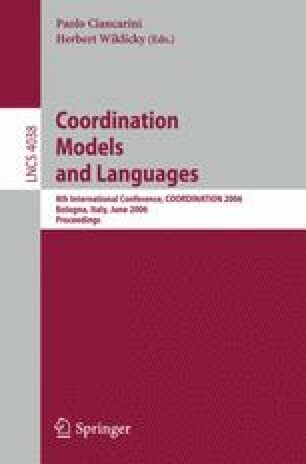 In a previous work we have presented a formal framework devoted to show the relevance of choreography and orchestration in the design of service oriented applications. Even if useful to start a formal investigation of the relationship between choreography and orchestration, the proposed framework was not suitable to specify real case studies. In fact, it simply permitted to specify all possible computations abstracting away from the conditions driving the choice of the actual behaviour. In this paper we tackle this problem by introducing the notion of state variables. The addition of state requires a substantial modification of the entire framework because the same state variable, at the level of choreography, can be actually stored in distributed orchestrators that will need to synchronize in order to maintain consistent views. In order to faithfully investigate this problem we also need to modify the formal model at the orchestration level, moving from synchronous to asynchronous communication as the latter is the communication modality of the ordinary communication infrastructures. Research partially funded by EU Integrated Project Sensoria, contract n. 016004.